The third post featuring the creations of the late mother-in-law of Frugal Scholar. 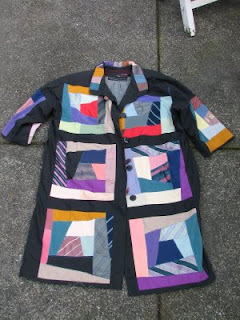 Below is a coat made of ties. Clothing made of ties is nothing new: I remember reading an interview with Jane Gallop, an academic provocatrice (is that a word? ), where she spoke of wearing a skirt of ties reputed to have been gathered from her sexual conquests. She refused, if I remember correctly, to confirm or deny those rumors. These ties belonged to the late Henri Coulette, the closest friend of my father-in-law, who recently celebrated his 90th birthday. Henri died at age 61 in 1988. He was divorced and had no children. As I recall, a battle over his estate ensued; fighting it out were his ex-wife and a nephew, whom he had never met. Presumably, a Bleak House scenario followed. My father-in-law loved Henri and gathered these ties that no one wanted. Henri was known as a spiffy dresser. My mother-in-law made this coat from some of them. Henri Coulette has the odd distinction of enjoying a cult, or underground reputation as an exemplar of what is often considered the most conservative mainstream of American poetry, the form-conscious, ironic academic poets of the 1950s, strongly influenced by the New Critics. Coulette's career foundered after the bizarre and accidental destruction of nearly every copy of his second book, but because of support from important admirers, and the resurgence of formalism in the 1980s and 1990s, he has come to be regarded as a poet's poet. I have fought a life long battle against ties. That is one sweet coat though! 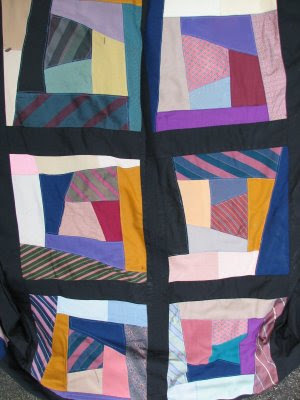 I love this coat -- the crazy quilt design of it, the color selections...very inspiring. I also think it is wonderful that you are sharing your MIL's creativity and joy with us. Wow, did your FIL (or anyone) wear this, or was it a commemorative creation? GREAT tie coat! I've seen others: usually the maker sews the ties together lengthwise to make a single piece of striped fabric (as it were) and then builds the coat of that. I love the effect your mother-in-law made with this. It combines two folk traditions, the tie coat and quilting. What a strange story about the guy's life. @ALL--We are going to relay all you compliments to my dear father-in-law. He will be so happy! (He doesn't use internet so we will have to send them). @Cubicle--Sometimes I think my husband went into teaching so he could avoid ties. @Duchesse--This was mostly just for display, though my mil did wear it a few times. My fil did once wear a dashiki in the 60s, much to the embarrassment of his children. @Funny--My DH and I collected some old quilts when we lived in the midwest and I think my mil was inspired by them when she made this. Strangely, I never met Henri and my husband never saw much of him. We didn't know any of the biographical details till we looked them up.